I want use flag Palestine.. Please fixing my flag Palestine. It doesn't work because flag codes aren't working yet on HTML5. If you go on Flash and write (flag#wPS) it should work just perfectly. It doesn't﻿﻿﻿ work because flag codes aren't working yet on HTML5. If you go on Flash and write (flag#wPS) it should work just perfectly. I think this flag#wps only have problem For me And MOD help??? Is work for bot only???? Both codes work perfectly in the FLASH version on xat for all users, not bot only. Based on the images you provided, you were doing the code on Mobile (HTML5) and the codes don't work there yet. As Leandro have stated above the flag codes only works on Flash for now. 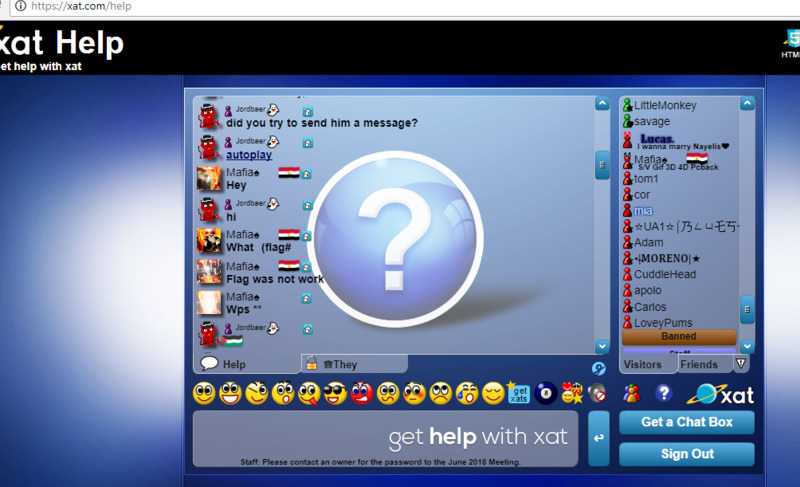 Flags codes on Flash chats works for users also and not just only by using bot. My apologies, as we lack of information (that you were accessing the chat html5), we are unable to properly explained to you. Your answer is not the correct answer to my question. I see all the media working correctly I just said that just flag # wps which does not work for me and in the chat help are you understand me. If the problem is in flash what is the rest of the flag for me doing? As Leandro have stated above the flag codes only works on Flash for now. Flags codes on Flash chats works for users also and not just by using bot. My apology, as we lack of information (that you were accessing the chat html5), we are unable to properly explained to you. As Leandro pointed out, make sure that you're on the flash chat when using the Palestine flag or any other flag. The chat in your second screenshot is the HTML5 which doesn't support the Flag power yet.